CI Filing provides custom blank tabs, in 90# and 110# white, from full cut to 1/25 cut and everything in between. For companies that need color tabs, we carry color printable Mylar tabs in a beautiful range of colors that can be cut to fit any custom tab size. Because of our enormous warehouse, CI Filing is able to stock plain 1/5 cut copier tabs. These stock copier tabs are available in 90# and 110# bright white FSC stock (our 90# copier tabs are also available with clear printable Mylar). Please specify if you need reverse or straight collation, individual positions, or three-hole punch we can comply with any request right on our premises. 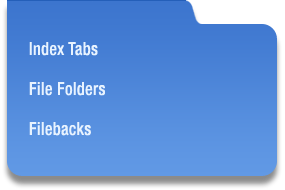 We offer volume discounts on copier tabs; please call for details: 973-890-2414. We package our blank copier tabs in crush-resistant cartons and each inner box is shrink wrapped to protect the tabs from moisture. That way, we ensure that these tabs will arrive ready to run through any high-speed copier without bends, dents or dings that can cause paper jams. It's just another way we take care of the details so your customers can take care of their businesses. 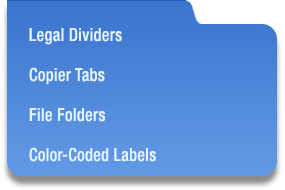 CI Filing stocks a full line of pocket folders-in stock and ready to ship! Or...in stock and ready to use as part of a custom designed project. Easy to use, self-adhesive base fasteners designed to allow your folder to function as a 3-ring binder: Install them when and where you need them, or ask about our custom assembly/installation services. Our shelf file folders are comparable to Smead®, Barkley® (F1190 & F1590), Safeguard®, GBS®, Tab® and many more, or we can custom run to match any style. CI Filing truly delivers a custom product at a competitive price you won't find anywhere else. We have a complete inventory with fasteners in position 1 and 3 and without fasteners ready for immediate shipment.